It’s autumn. The promise of a new season. New beginnings. New dreams... A season of gathering, being with those you love most, celebrating amongst the warm glow of candlelight, laughter, good food and music, making memories for a lifetime. One of our close friends is about to embark on a new beginning in her life this autumnal season. A destination wedding this fall in Savannah, Georgia, amongst the old oak trees heavy with Spanish moss, and beautifully eerie graveyards. It will be a magical evening full of love, warmth, good Southern food, lively music, glowing lights, joy, whiskey, lace and the celebrating of two lives joining together. We wanted to honor her upcoming nuptials by designing her wedding invitation suite. Our inspiration was “whiskey + lace” which sums up the soon to be Mr. and Mrs. The wedding will be steeped in tradition but with simplicity and a down to earth relaxed vibe resonating throughout each detail. We knew we wanted the quality to be apparent from the moment you pulled the invite of out its envelope. We were helping to announce a marriage after all, the ultimate celebration. Nothing less than beautiful heavy card stock would do, to let everyone know, this night is going to be special and the bride and groom can’t wait to celebrate with you, because you are special to them. We wanted to be able to bring our design to a stationery and paper company, and have them bring it to life for us. We had researched a few other companies but one reason or another it was not a fit. They couldn’t print our design, the card-stock was low quality, the prices were out of budget, the colors were off...it was much more of a challenge than we expected. Until Basic Invite coincidentally reached out to us, or by divination, since there are no coincidences, right? We knew immediately they were the perfect fit. The customer service was on point. The paper selection was exactly what we were searching for. Their turn around time was excellent. And navigating their website is seamless, making it easy to create exactly what we were looking for. Basic Invite allows you to bring your own design to life. 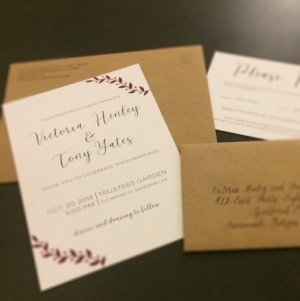 If you’re not a designer, they have an extensive set of customizable designs for any type of invite (or card) you could want– from wedding invites to holiday cards to birth announcements. Here are a few things we really loved about working with Basic Invite. Flexibility: While we opted to create our own wedding invite and rsvp card for our friend, we wanted help creating the outer envelopes. It was such a great process. Not only can you choose from a ton of color options, there is also a huge selection of fonts to chose from as well. Basic Invite literally gives you the option to edit your design and see the edit on your invite immediately. Color Options: Almost unlimited ink color options and 40 different colors of envelopes. When designing the printed envelopes, we went through several iterations to play with what colors would go best with the invite design. We ultimately settled on a hearty kraft paper indicative of a glass of whiskey for the envelope and squid colored ink perfect for the fall vibe we wanted to imbue. While we kept it simple, there are colors to satisfy every design you could imagine. Custom Samples: Like we said above, we went through several companies before we serendipitously connected with Basic Invite, and none of them offer a customized sample. When thinking of how special we wanted the invites to be, but not having the option to see how one would look before committing to printing all the invites, we were hesitant. Too much money and time would be spent. Wonder if something was not perfect? Having the option to see a sample of our design before committing to printing gave us peace of mind and made us even more excited for the final invite. Address Collection Service: We had our envelopes printed with both the return and the guest’s addresses. It was a simple and elevated way to keep everything clean and consistent. Basic Invite made it really simple to upload and format all the addresses correctly. Quality: The quality is beautiful. We opted for this gorgeous hearty card stock and it is perfect. The paper is sophisticated and the printing is on point. The colors were an exact match to how we designed it and we, along with the bride and groom to be, were ecstatic. Wedding invitations have been sent. RVSP’s have been received. And we can’t wait to celebrate our friends wedding next month in the hauntingly beautiful Savannah, Georgia. The only thing left to do now is dream up the next excuse for printing more beautiful cards… Of course we suggested customized thank you cards from the bride and groom… but what about from Curated California…Fall Full Moon Soiree? Farm to Table Thanksgiving Dinner? Christmas cards? So much celebrating to do this season and so many cards to design with Basic Invite!